There are many programs that focus on the restoration and preservation of our beloved Chesapeake Bay, but one local program is generating a lot of interest amongst slip holders here at Bert Jabin Yacht Yard. As boaters, the need to replenish and reestablish oysters in our waters is a must. For us, this equates to not only cleaner water to boat on, but also a healthier habitat for the native critters that call the Chesapeake Bay home. In addition to providing habitat for fish, crabs, and other aquatic life, adult oysters can filter approximately 50 gallons of water every day. Prior to their downfall, the historical oyster population could filter the entire volume of the Chesapeake Bay in approximately four days…which is simply astonishing! Today, with the natural population at around 1% of what it used to be, this task can take almost an entire year. Recognizing the need to restore the oyster population, the Chesapeake Bay Foundation established the Oyster Gardening Program. This program provides the knowledge, instruction, and supplies needed to enable those interested the opportunity to become involved in the effort to reestablish the dwindling species. 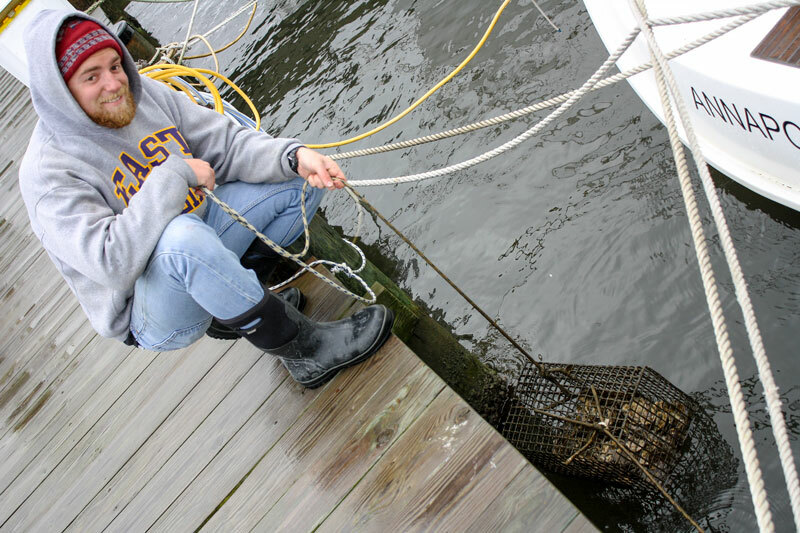 To grow oysters, participants attend a free workshop where they are provided the supplies and instruction to build wire mesh cages to hang from their docks. Participants also receive a batch of seed oysters to get started. Once the oysters are between 1-2 inches long, they are returned to the Chesapeake Bay Foundation to be planted on sanctuary reefs throughout Maryland waters. The idea is that participants will continue to grow a new crop of oysters each year. Rod Jabin Jr holding up an example of an Oyster basket here at BJYY. Care for the baby oysters is minimal. During the summer months, the warmer water encourages rapid algae growth, which in turn means that the cages have to be maintained and cleaned weekly to prevent them from fouling (much like a boat bottom would without bottom paint). Over the winter months, however, the colder water slows the rate of algae growth, therefore the only concern during this season is to make sure that the oysters are not exposed to freezing air when the tide is out. For this reason, although gardeners can keep their oysters for the full year, most receive their oysters in the fall and return them to the Chesapeake Bay Foundation in the spring. All in all, the program is a simple, fun way to do your part and become involved…and Bert Jabin Yacht Yard would like to help. If you are interested in participating and/or learning more about the Chesapeake Bay Foundation’s Oyster Gardening Program, we would like to know! Contact Joanna Haaland (joanna@bjyy.com) for more details.